You would think that a pitch shot would be easier for golfers because of the shorter swing required. But sadly, most amateur golfers hit worse pitch shots than they do full shots. It doesn’t need to be like that and I’m going to explain why this is often the case, and what you can do about it. One of the biggest reasons why golfers often hit pitch shots fat and thin is because they overuse their arms and their hands when pitching to try to get these shots up in the air. But as you hopefully already know, to make the golf ball go up you must hit down. 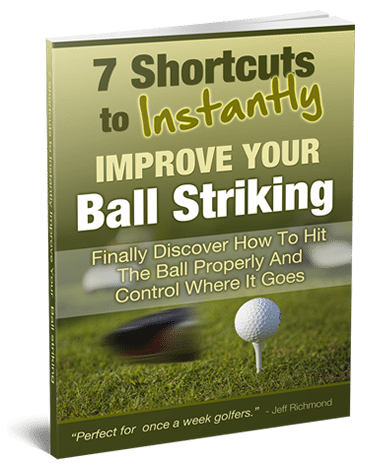 And even though most golfers know that fact it can still be hard to do. So here’s a great pitching drill to help you pitch the ball with more authority. 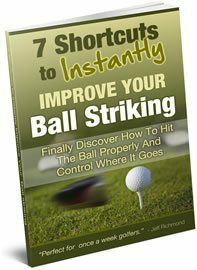 To do this pitching drill setup to a golf ball as though you are going to pitch it. Then before you start your swing place a ball about 8-10 inches behind the ball you are about to pitch. Once setup then make your normal pitching swing. If you hit the ball that is behind your original ball in the backswing, that means that your pitching backswing is not steep enough. Also, if you hit the second ball on your downswing that means your downswing is not steep enough and you are trying to sweep the ball to get it up in the air. When you hit pitch shots your backswing and downswing needs to be steep so you hit down on the ball first and then take a divot. It’s important to note that when you’re hitting a pitch shot your weight should be positioned about 60 -70% on your left side at address. So if you found a problem with your backswing or downswing by doing this pitching drill then the solution is simple. Keep doing this drill until you can miss the second ball consistently and make crisp, clean contact with your first ball. To make sure you don’t slip back into bad habits you should do this pitching drill once every month or so.